Cal McGill, with his aptly named business Flotsam and Jetsom Investigations, is an expert on ocean currents and other influencing factors to the point that he can identify where a body (or anything else) which has washed ashore originated from and, as importantly, where it could not have come from. To that end he is employed here on several investigations including some severed feet appearing randomly on European beaches and a heartbreaking search for the truth about what happened to an unidentified young girl whose body washed ashore some years earlier. He is also determined to uncover the truth of his grandfather’s death which occurred during the second world war. When I am perusing the best seller shelves at my local chain store I often think the only thing that matters in getting a book published these days is having an interesting premise. 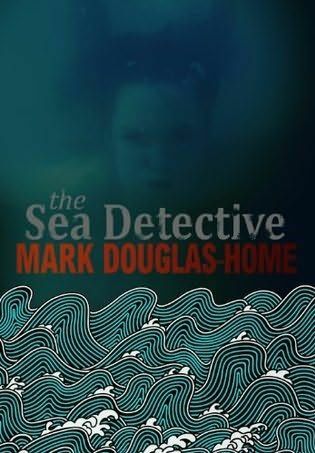 Whether or not you can follow up with characters, storyline and interesting themes seems irrelevant but happily THE SEA DETECTIVE delivers all of those in addition to its unique premise. It’s a delightful read. When we’re introduced to Cal he is worrying that he has no escape route from some nefarious night time activity in which he is engaged. The commentary manages to be both suspenseful and funny and there’s genuine surprise when we learn exactly what Cal was doing. This quickly establishes Cal as an interesting character – intelligent, committed, practical and droll – and he only grows more so as we learn more about him. Other equally well drawn characters abound including a boorish Detective Inspector, a terrified young Indian girl who has escaped from horrendous abuse and an intelligent but not physically beautiful policewoman whose boss (the aforementioned DI) is far too narrow-minded to take advantage of her skills. They play out their roles in a complex but very satisfying storyline that weaves many elements together and keeps the reader (well this one at least) thoroughly gripped throughout. There are some genuinely fascinating topics raised in the book, an exploration of the alarming fate that awaits many Bedia girls in India for example, but any information about them is imparted lightly and credibly by the characters with the author’s voice entirely absent. Of course this should always be the case but often isn’t. I imagine Douglas-Home’s background in newspapers plays some part in enabling him to write readably, with a nice mix of depth and pace. In short this is a terrific read that entertains, engages and informs. There is even a fabulous sense of place, particularly the remote Scottish island that is Cal’s ancestral home. Highly recommended. This entry was posted in book review, Mark Douglas--Home, Scotland. Bookmark the permalink. Bernadette – Oh, I already like Cal and I’ve not even ‘met’ him yet. I think it’s fascinating to have that much knowledge of the way the ocean works, and I have to say I like the name of his company. The story threads sound interesting too, and I notice that this is not one of those doorstop-size tomes either. You’ve definitely sold me on this one. And yup – available where I am, and on Kindle too. No excuses for me …. Thanks, Bernadette – definitely one for the TBR pile – it sounds very distinctive and very good. On a more superficial note: what a lovely cover design! Not a standalone, Mark has just this month sent volume two of Cal’ s adventures to his publisher ready for launch in the spring (can’t wait). Mark is also one of that rare breed of authors who is in dialogue with his readers, he sent a charming e-mail following my review on Amazon, and kept me up to date since. Worth a visit on Facebook too! Oh that’s good to know that there is a second book due out soon, I won’t be visiting the author on Facebook as I don’t ‘do’ Facebook (last human being on earth not to have a page I suppose but I’m not even tempted) but it’s still good to know he is an approachable type. I shall look out for book two. Sounds good Bernadette and I’m going to put it on my ‘maybe’ list as I have quite a lot to read at the moment. Like Mrs P, I like the cover! I want to read this one! Cal sounds like such an interesting character. I just checked and my library doesn’t carry it, but it looks like I can get the Kindle version. Sticking this one on my to-buy list. Good review and have this nestling on my e-reader already so will endeavour to make the time to read it! I am about 3/4 of the way through this book, and your review helped to steer me towards it. Although I got lost in the first 40 pages, once I got through those, I was anchored. It’s a book I can’t wait to get back to. In fact, I’m working on something with a deadline, and I keep sneaking over to the book to read a few pages — you know how that goes. I am enjoying the parts about the Scottish islands, perhaps because part of my heritage is Irish, and there’s Gaelic involved in this book. The sense of place is very well written. The part about human trafficking is so disturbing, however, this is reality, unfortunately. Interesting that there is at least one more book coming. I’ll be reading it. This is a very unusual book that ties in very dissimilar subjects, but the author pulls it off.